6 in looks true age is unknown. Rage looks to be 6 years old but her true age is unknown. 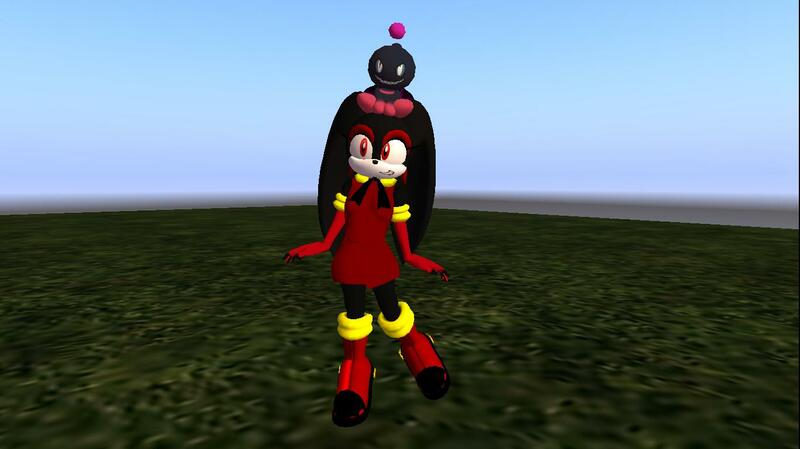 She loves her little Dark Chao she named grin. Grin was a gift from her master on the day she awoke for the first time. She has the ability to throw fire balls and once she goes berserk she can use her ultimate attack called explosion. This attack can destroy city blocks. She was created for Black Arms to be the Anti-Cream the Rabbit. A little on the wild side and and loyal to her dead master. She Misses her master and was promised by Black doom that he can bring her dead master back to life. She follows the orders of Black Doom for her dead master but for how long? In her mind everything is about her. Her wants come before any others even Black Dooms.She is level headed when calm but easy to set off into fits of rage. Rage has a hot temper with a sharp tongue. She is not afraid to tell others what she thinks or how she feels. The only one she can't seem to speak to is shadow. She does not know why all she knows is she must do something to stop it. Loves her old master and Dark Chao Grin more then life. Her favorite thing to eat is carrots and Carrot cake. She has feelings for shadow but can't seem to tell him. She hates to be told what to do and any who make fun of her, her dead master, or Grin. Rage was made by her dead master for Dark arms to use as they wish. Her master started to see her as his own daughter once she was awaken from her slumber. He wanted to leave with her in middle of a war but his ship was destroyed by Black doom when she was in a battle. Once she heard if his death and the lie Black doom told her she left to the middle of the battle and with a flash of flames the battle field was nothing more than ash and flames. Doom told her that he can bring her master back to life but she must follow his orders. Her fur is ash black with a white mouth and chest fur. She has the body of a 6 year old but true age is unknown. She has on a red dress, gloves, and high heel boots. She is never with out her Dark Chao Grin.